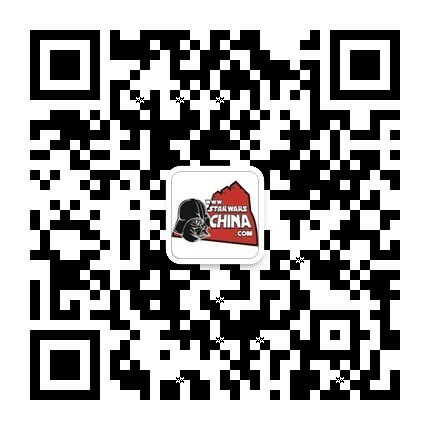 ﻿﻿ 寻的蜘蛛机器人（homing spider droid） - Databank - 星球大战中文网 Star Wars China - Powered by Discuz! 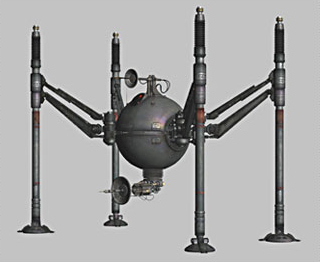 A large, mobile engine of destruction employed in the Commerce Guild's private droid army, the homing spider droid is specifically geared for anti-vehicular combat. The orb-shaped central body is equipped with sensor equipment, and a powerful dish-shaped laser cannon capable of firing a sustained beam at enemy targets. Moving the droid across rugged battlefields at impressive speeds are four all-terrain stilt-like legs. The Commerce Guild encompasses a number of leading corporations that aquire, process and refine raw materials throughout the galaxy. As such, the guild oversees thousands of mines. To enforce guild membership and policies and to protect guild interests, Presidente Shu Mai approved the use of the homing spider droids. The large spindly automatons employ advanced sensors and parallax signal tracing dishes to track down targets. Their elevated height allows them to acquire both ground and air targets. Their modular weapon mounts allow them to be fitted with mission-specific ordnance. 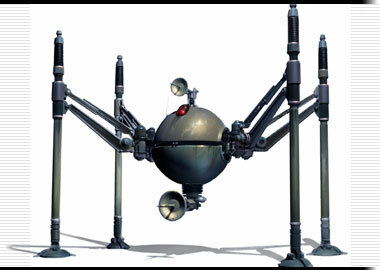 During post-production, the homing spider droid was known simply as "Commerce Guild droid B."